Day in the Life of a Little Girl, a Norman Rockwell painting, appeared on the cover of The Saturday Evening Post published August 30, 1952. This is yet another timeless favorite of Rockwell collectors, a classic for all the ages. This painting was Rockwell's 273rd overall out of 322 total paintings that were published on the cover of the Saturday Evening Post. Rockwell's career with the Post spanned 47 years, from his first cover illustration, Boy With Baby Carriage in 1916 to his last, Portrait of John F. Kennedy, in 1963. This was also the fourth cover for The Post in 1952. In 1952, there were five Norman Rockwell Saturday Evening Post covers published. The original oil on canvas painting, 45 x 42 inches or 114.5 x 106.5 cm, is currently part of the collection of the Norman Rockwell Museum of Stockbridge MA. on page 192 and color plate 21 of Norman Rockwell, A Definitive Catalogue by Laurie Norton Moffatt. 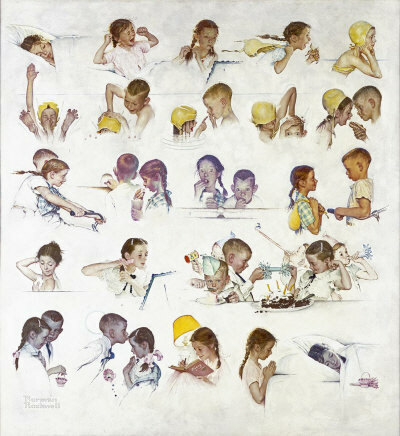 Many of the photographs used in the painting of this illustration, as well as the painting itself, are reproduced in Norman Rockwell: Behind the Camera by Ron Schick on pages 122 through 125. There is also an extensive section devoted to the memories of the model for this picture, Mary Whalen Leonard, who was also the model in Girl at Mirror and Girl with Black Eye. Mary was the daughter of Rockwell's attorney. This painting, actually a series of narrative paintings, is aptly named. It continues the theme Rockwell started with Day in the Life of a Little Boy. The story told in the painting starts with the girl.odeled by Mary Whelan still fast asleep. Then the little girl's day starts as she wakes up. She fixes her hair in the mirror and heads out the door. The painting was published in August, so she is still enjoying her summer vacation. She is headed to the swimming pool. In the fourth illustration, we can see her running so fast that her pigtails are trailing behind. She is also enjoying a banana as her snack. Next we see her donning her swimming cap. The next panel shows her holding her nose, raising her right arm and plunging into the water. As she returns, a boy she knows pushes her head back under the water. She re-surfaces with an angry expression and her index finger painting at the boy. The next panel shows her returning the dunk to the boy. Chuck Marsh was the model for the boy. Now things get interesting. The boy offers her a bite from his lunch, a hot dog. The next panel shows the little boy and the little girl riding on his bike. Next we see their destination: the movie show. The boy pays their way into the movie. Next we see the little couple sitting in the darkened theatre. They are eating popcorn and watching the movie wide-eyed. Now the boy drops her off at home, but the story doesn't end there. The next two panels show the little girl cleaning up and fixing her hair. We find out why in the next panel. Now we see the little girl attending a birthday party. She is playing a party game with the same boy from the pool and the movies. We can also see other children in the foreground and in the background. Those other boys were modeled by Mary's twin brother Peter and Chuck Marsh's younger brother. The next panel show the little boy walking the little girl home. Next he stops and kisses her on the forehead. She looks suprised and almost taken aback. The last three installments in the story take place in the little girl's bedroom. First we see her writing in her diary and smiling. Apparently she has decided that she likes the little boy's affections and attentions. The next panel shows her saying her goodnight prayers. Norman Rockwell caught some criticism for not including a good night prayer in Day in the Life of a Little Boy. So he remembered to include that part of his narrative in this composition. Day in the Life of a Little Girl was only one of 322 Norman Rockwell Saturday Evening Post covers; Here is the list of Norman Rockwell Saturday Evening Post cover illustrations. The last part of the story shows Mary alseep again, this time the lighting clearly indicating that it is nighttime. She also still shows a faint smile remembering her eventful day. She has also laid her party favor and her party whistle on her bed. Norman Rockwell accurately imagined and portrayed this little girl's day, then he captured those events on canvas in style and emotion as only he was able. Do You Have A Great Story, Opinion Or Contribution About Day in the Life of a Girl?